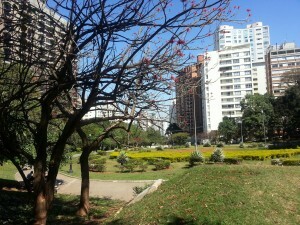 São Paulo! This cosmopolitan metropolis is filled with the beauty of its contradiction. A city brimming with skyscrapers as far as the eye can see sits in perfect harmony with its countless parks, tree lined avenues and garden walls. We sampled its divine cuisine and danced the Samba all in an effort to blow off a little steam as the Investir USA Expo was a great success! The Expo drew in over 1500 attendees who lined up at the front door of the hotel on day one. The event was exclusively targeted to illustrate Florida real estate options and my colleagues from every part of the state were in attendance. Real estate brokers, agents, and independent investors worked the room over the 2 day event. The education speaker series provided additional information to attendees and it was a catalyst for Naples Meridian as our presentation on Investing in Southwest Florida was very well received. As the Expo drew to a close we spent a few days meeting with agents and investors. We visited development sites and toured the city to understand the prime real estate areas. Our visit solidified our understanding of the Brazilians’ expectations regarding location, amenities and style. They are drawn to living in the middle of the action where they can walk to everything as the traffic in this city is truly shocking. Brazilians favor strong geometric exterior design that is popular in Miami. Sleek interiors, open plan living and light filled rooms are a must. For those that live outside the city tend to purchase lots and build structures to the edge of the property line, often relinquishing their gardens. Buyers will even approach their adjoining neighbors to purchase their property so as to extend their living quarters even further. With a population of over 20 million inhabitants in São Paulo alone, these residents are very motivated to solidify their footprint on their land. We departed São Paulo with wonderful memories of the culture, the people and its variety. We look forward to hosting our new friends in Naples over the next few months as connecting the real estate dots between our locations is a match made in heaven! Click on each individual image below to access the gallary.